A Victorian Gothic house built in Clarence Road adjacent to Clarence mill in about 1840 by Martin Swindells I, but he never lived in it – he died in 1843. T-shaped in plan, Ashlar buff sandstone, Welsh slate roof and five stone chimneys. 2½-storey, four-bay south front in Tudor Gothick style. With first and third bays stepping forward under gables. 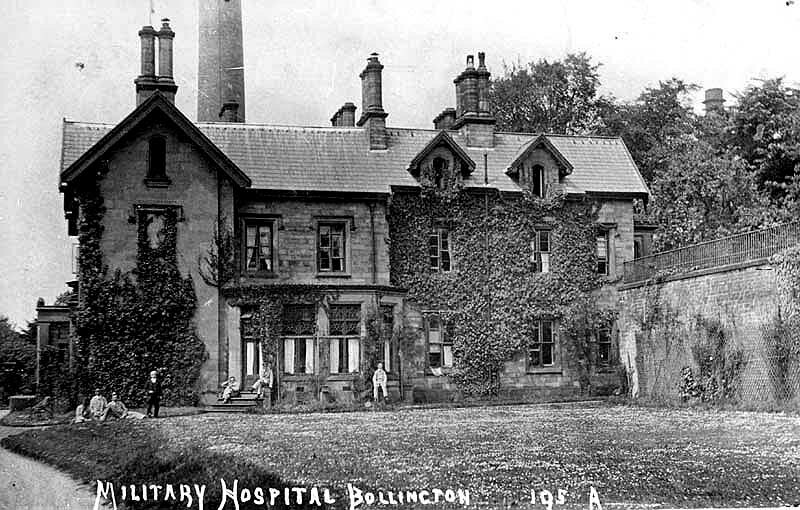 During WWI Rock Bank House was used as a recovery home for injured servicemen. Today the house and its stable block are divided into apartments and rather incongruously, and regrettably, known as Carterbench House. The land behind the house, once part of the estate, contains the houses of Rock Bank Rise. 1851. Martin Swindells ll aged thirty seven years and widowed. He lived with his son Frederick aged 6 years.They had four servants one of which he later married. Her name was Charlotte Rowley and she was twenty six years old. Previously he had lived in Ingersley Clough house with his first wife Frances. 1861. Martin Swindells II is still at Rock Bank with his wife Charlotte thirty six years.They have eight children all but the eldest Martin III are from his second wife Charlotte. 1871. The Swindells are still living here, now with nine children, three born since the last census and some have left home by this point. 1876 Rock Bank House was sold by Martin Swindells ll to Fred Wilkinson a director of Brooke, Swindells and Co .
1891.George Cawley Swindells was now the resident he was forty three years old, he was a cotton spinner and doubler. He lived at Rock Bank with his wife Helena aged Thirty eight years and two children, Bernard aged 3 yrs and Agatha aged just 1 year. Also there was a sick nurse and a cook. 1901. Alfred John King aged forty two years lived at Rock Bank house having previously lived next door at Limefield House. He was MP for the Knutsford division which included Bollington. Occupation cotton cloth bleacher and finisher. Alfred lived here with his daughter Ida May aged 11 years and two sons John 7 years and Philip 4 years. There were also four servants and a visitor. Alfred is listed as married but his wife does not appear on this census. Moving on to the twentieth century. 1939. Richard Holt aged fifty eight years was a caretaker at a cotton mill (unreadable). He lived with his wife Sarah who was sixty years old and described as a Housekeeper. In the 1950`s and 1960`s Rock Bank House was used by Fine Spinners and Doublers testing yarn for Clarence Mill. Later when Clarence Mill closed this was taken over by Courtaulds and yarn was made for seat belts. In the 1960`s and 1970`s Stockdale Engineering were at Rock Bank. They were filtration engineers, filtering particles of water waste from heavy industry. They had installed steel girders in one part of Rock Bank. A company who tested pregnancy samples also occupied Rock Bank in the 1970`s on the ground floor to the right of the main entrance. Carterbench Advertising came from Poynton to Bollington in the early 1980`s. It occupied Rock Bank House until it merged with Manchester based Brunnings. 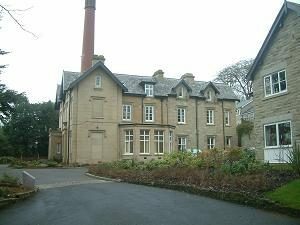 There was a subsidiary company Carterbench Product Development that designed toys.They separated and moved to Cheadle following the merger with Brunnings and came back to Fernbank House on Tytherington Business Park in 1995. And finally King Edward street in 2018. Notable toys they created in the 1980`s were,`The Big Yellow Teapot`.There were close ties with Peter Pan, Bluebird, and Kiddicraft during their time at Rock Bank. Some of their long term clients were Cheshire Building Society, The Isle Of Man Steam Packet Company , Holland Pies and Peter Pan. When they moved into Rock Bank the laboratory`s had been on the upper floor, Dragon TV rented the middle floor until they moved to the church at the bottom of Beeston Brow, and Carterbench had the ground floor and the upper floor until taking over the entire building.The basement had an art studio run by Dennis Gideon. The long building at the back of Rock Bank House as seen on the aerial view was used as a drawing office plus a workshop where prototype designs were made and tested, of what is not sure. And also used for Chemical research. This long building was knocked down in the 1980`s and new houses built there. History has it that Rock Bank is haunted. 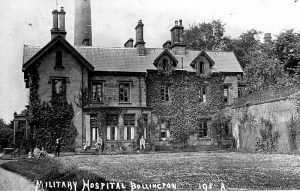 One of the top rooms reverts to a Victorian nursery and the ghost of a nurse stands at the top of the stairs, many sightings apparently. And in the 1980`s it is believed there were old stone slabs in the cellar it had been used as a Morgue. Above aerial view from around 1900. Rock Bank House in the foreground along with part of the Chimney of Clarence Mill. 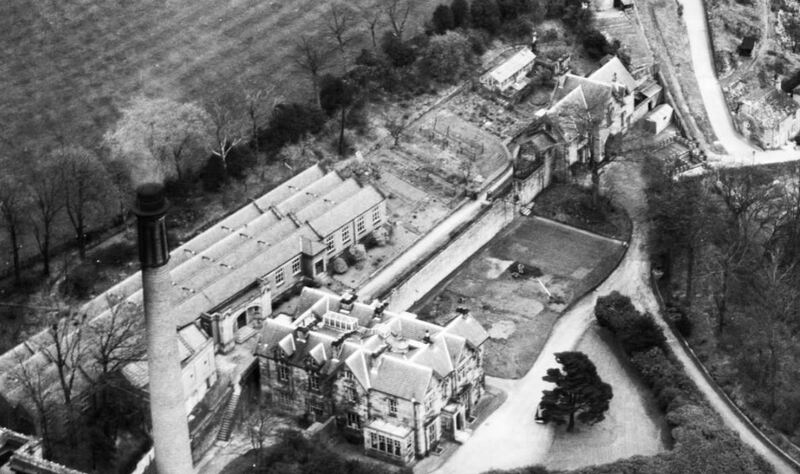 The long buildings to the left as described above and at the top of the photo is the Stables and Coach House which is now a private house to which there used to be an entrance from Beeston Brow. Photo from Britain From Above.